Find phlebotomy training classes in New Jersey below! Award-winning as Central New Jersey’s Leader in Medical Education, Advantage Career Institute specializes in a Phlebotomy Technician Training Program for students seeking a break into the medical field. 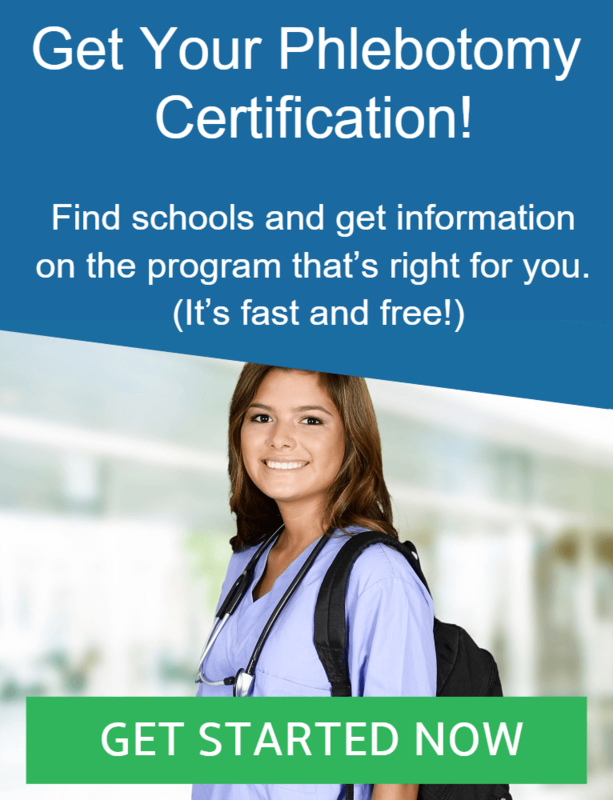 New phlebotomists are capable of working in outpatient clinics, nursing homes, blood banks, emergency rooms, general hospitals, and national medical facilities, if they have passed the national phlebotomy certification exam. This particular phlebotomy training course combines the coursework, learning knowledge, and experience for both Phlebotomy and EKG Technicians. Students enrolled in this combination course will learn through on-campus lectures, take-home written assignments, and hands-on practical application. The coursework covers the basics of phlebotomy, anatomy and physiology, medical terminology, blood vessels, hematology, anemia, phlebotomy diagnostics, blood drawing techniques, and bloodwork processing and transportation. Mastering phlebotomy takes time and dedication, specifically to a phlebotomy training program, such as the one offered at Rutgers School of Health Related Professions. Students here are taught the basics of phlebotomy, medical terminology, human anatomy and physiology, legal responsibilities, infection control, and laboratory safety measures. Through classroom lectures and hands-on practical applications, students will learn about, then perform, venipuncture, skin punctures, and specimen collections. Phlebotomists-to-be use mannequin arms and electronic devices first, then advance to drawing blood from fellow students and volunteers. Under the supervision of professional phlebotomists, of course. Students who complete the required on-campus time are required to partake in 120 hours of clinical rotations. During this time, students will demonstrate their phlebotomy knowledge by with 100 successful venipunctures or capillary punctures. After earning a certificate of completion, graduates of this phlebotomy training course are eligible to sit for the national phlebotomy certification exam. Passing this exam gives new phlebotomists free reign to work in their choice of nationwide medical facilities. Designed for students with minimal to no medical knowledge, this phlebotomy training program, offered at Sussex County Community College, is a 10-week, fast-track course for those seeking an entry-level position in the healthcare field. Phlebotomists are essential to medical teams. Their responsibilities include, but are not limited to, blood drawing, specimen collection, bloodwork processing and transportation, infection control, patient health history updates, specimen diagnostics, and interpersonal patient communication. This phlebotomy training course is a pre-requisite for the national phlebotomy certification exam. Passing this 100-hour course, then passing the certification exam, will grant new phlebotomists the legal rights to work in medical facilities, hospitals, and clinics nationwide. The Best Care Training Institute has a knack for training some of the best phlebotomists in the medical field. Their comprehensive, fast-paced phlebotomy training program is designed to assist phlebotomists-to-be with breaking into the healthcare industry, via an entry-level position as a phlebotomist at outpatient care centers, hospitals, blood banks, nursing homes, and healthcare clinics. This Phlebotomy Program offers students basic knowledge of phlebotomy, inclusive of medical terminology, infection control, laboratory safety standards, blood drawing techniques, and bloodwork processing, transportation, and diagnostics. Those who enroll in this program are required to complete an overall 80 hours of phlebotomy training. This consists of 50 hours of classroom lectures and lab instruction, as well as 30 hours of hands-on clinical experience. Upon course completion, students should be able to demonstrate their new knowledge of phlebotomy by performing a blood drawing, under the supervision of a professional phlebotomy instructor. Afterwards, graduates will receive a certificate of course completion. Location: 4500 New Brunswick Ave. Preparing students for the upcoming national phlebotomy certification exam, the Phlebotomy Technician Training Program of the American Institute of Medical Sciences and Education offers phlebotomists-to-be the chance to hone, and then prove, their knowledge of phlebotomy. During this course, students will learn how to draw blood via venipunctures, skin punctures, and capillary punctures. They will also develop a basic knowledge of phlebotomy, medical jargon, healthcare terminology and procedures, infection control, laboratory safety standards, blood drawing techniques, and interpersonal patient communication. This phlebotomy training course consists of 80 clock hours of accommodating day, evening, or weekend classes. The pre-requisite to attend is a High School Diploma or GED. This class includes hands-on practical experience in a clinical setting, as well as on-campus lectures with written assignment for take-home studies. Those who complete this course, and then pass the national phlebotomy certification exam, will be able to work in nationwide hospitals, research labs, private clinics, nursing homes, and pathology labs. Combining on-campus lectures, written take-home assignments, lab studies, and clinical practice experiences, this 120-hour phlebotomy training program is comprehensive and fast-paced, courtesy of the Healthcare Training Institute. Designed for students who wish to acquire an entry-level position in the healthcare profession, this program guides students through the basics of phlebotomy, inclusive of medical terminology, anatomy and physiology, infection control, and laboratory safety standards. Throughout the program, students will be expected to demonstrate their new knowledge of phlebotomy. These demonstrations span everything from classroom presentations to performing blood draws on simulation limbs, fellow students, or volunteers. All under the careful supervision of a professional medical instructor, of course. After receiving a certificate of course completion, graduates of this phlebotomy training program are capable of sitting for the national phlebotomy certification exam. Those who pass this important exam will attain the title of Phlebotomy Technician, enabling them to work in nationwide healthcare clinics.